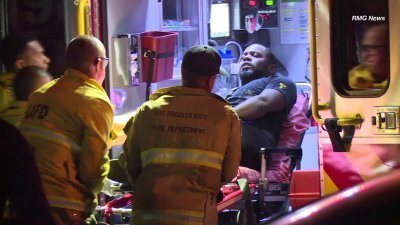 A man was apparently shot in the leg while driving on the 210 Freeway in Sylmar late Tuesday night and the gunman is still on the loose. The victim told authorities he was traveling eastbound on the freeway between Polk Street and Maclay Street at about 11:20 p.m. when someone opened fire, California Highway Patrol Sgt. Chris Cabral said. “It was confirmed by a victim that had been shot in the left thigh,” Cabral said. The man exited the freeway on Maclay Street and stopped at a UPS station where he treated himself with a tourniquet. Video from the scene later showed a man with a leg wound being loaded into an ambulance. The victim is expected to make a full recovery, Cabral said. Investigators have not confirmed the suspect’s vehicle information, but Cabral said it was possibly a white, late 90s or early 2000s Ford Explorer. The gunman’s vehicle continued eastbound on the freeway following the shooting.